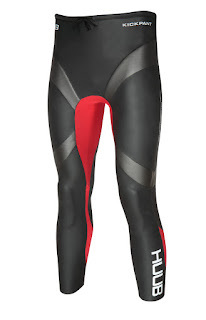 Announcing The New HUUB Kickpant ~ Feel For The Water! Advice & Tips to Improve Your Swimming. Don't miss the special launch worldwide free shipping offer - must finish June 17th! Until now the buoyancy shorts on the market have simply lifted you higher in the water (much as a pull-buoy would) but offered you very little else to improve your swimming. 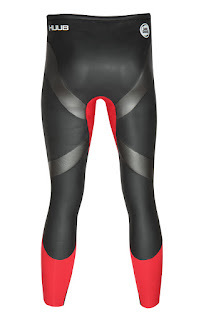 The HUUB Kickpant not only lifts you higher (in fact the 3/4 length design lifts you higher than any other buoyancy short) but the clever addition of high density neoprene and modulus insertion over the knee actively controls knee bend pushing you into a straighter leg kick technique as you swim. What's more, the Kickpant features the lower half of HUUB's clever X-O skeleton system from their full wetsuits to improve your alignment and reduce snaking through the core. The result is faster, more efficient swimming. ...as many strong/athletic body types do, then the new Kickpant is the perfect training tool for you to improve your swimming. Use it regularly in your pool training to simulate swimming in your wetsuit (without overheating) and you learn a better stroke technique whilst adapting to the higher stroke rate from swimming more quickly. Don your full HUUB wetsuit on race day and you're perfectly prepared for maximum performance! Training with a pull buoy also lifts the legs but it has two major disadvantages - because you have to hold your legs together to keep the buoy in place, it masks any problems with your leg kick. And secondly because you're not kicking at all, it causes your kicking muscle groups to de-condition. This is the real power of the Kickpant - ditch the pull buoy, use the Kickpant instead and get your swimming technique back on track! To really make this unique product complete, we've written you some specific Kickpant training sessions to follow in the Swim Smooth Guru virtual coach app. Every Kickpant purchaser receives a free month's use of the Guru to follow the sessions and get maximum use from them - developing your stroke rate, body position, kicking technique and sense of pacing ready for race day. Hi Tessa - they're mainly designed for use by men. Most women don't need a buoyancy short as they have better body positions naturally - in fact too much buoyancy at the rear would be detrimental to their stroke. The few women who do have sinky legs are normally of a strong build with narrower hips and should fit quite nicely into the Kickpants. Hi Michelle - yes I think there's definitely a case to go smaller, watch this space! A lot of the triathletes that I see have "sinky legs" because of tight hip flexors, mainly due to the volume of cycling and swimming that they do. Are you suggesting that these pants will overcome that or should the swimmers also engage in a consistent programme of stretching as well? 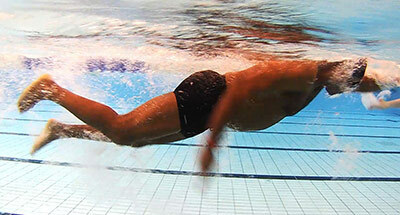 The Kickpant certainly isn't a silver bullet for fixing a swimmer's body position but it is a very useful tool because it allows the swimmer to swim "properly" for a while and work on those parts of the stroke that normally never get any attention because of that feeling of "struggle". I don't think enough triathletes give the stretching its full due. There's a lot of "hidden" work that the elite swimmers do which enables them to perform as well as they do.